Hi there! I love making cards with funny critters in it! It’s so much fun! For this project, I stamped all the critters with Memento Tuxedo Black ink, colored them with Copics and fussy cut them. On my card base I stamped a pearch and some blooms, both from Purple Onion Designs, to create a background for my scene. I added one critter on the branch and the other on the ground – like he was whatching the scene. Both of them are from Purple Onion Designs. [ Ciao a tutti! Ormai l’avrete capito…adoro creare biglietti pieni di animaletti simpatici! È così divertente! 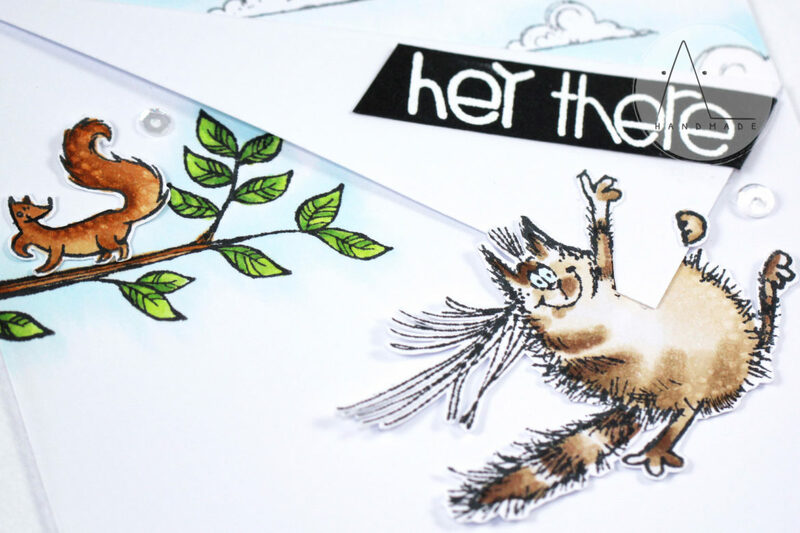 I added the cat (from Penny Black – Good day! stamp set) to the scene hanging at the edge of my card base trying to reach the perch. I stamped some clouds on a second panel and added it to the front one of my card base, which I previously folded to add the cat. Finally, I embossed the sentiment from Sentiment Sampler by Paper Smooches on black cardstock. [ Ho aggiunto il gatto (dal set Good Day! di Penny Black) alla mia scena, appendendolo ad un angolo della mia card base, come se si stesse arrampicando per raggiungere il ramo. Ho timbrato alcune nuvole su un secondo pezzo di carta e le ho incollate dietro la card base piegata. Penny Black – Good day!